When my sister told me I could make my own bridesmaid bouquet it made the idea of a hot pink strapless dress seem that much easier. Not only could I turn this bouquet into a DIY project I was also allowed to make it colorful. Really colorful. Got your own eclectic wedding on the agenda? 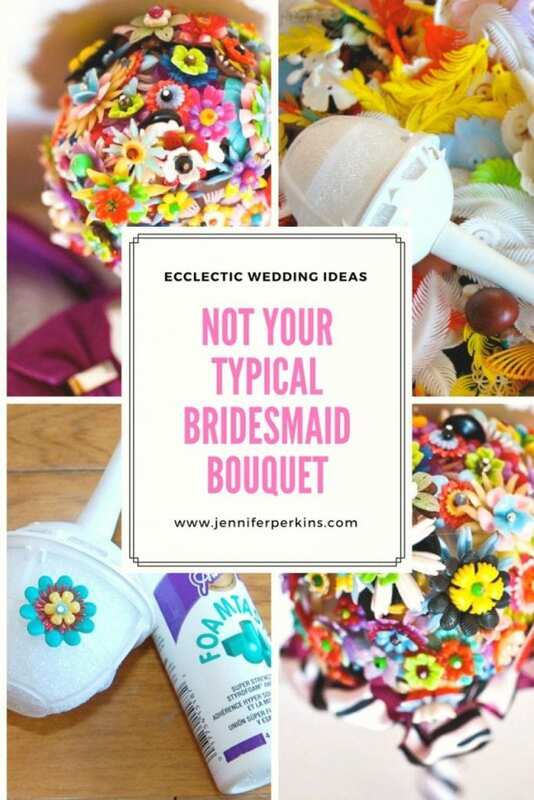 Let me tell you how I crafted my own not so typical kitschy and whimsical bridesmaid bouquet. I should mention that my sister also carried a DIY bouquet at the wedding. Her bouquet was full of new and vintage rhinestone jewelry. A little more classy than my plastic petals, but also handmade and fabulous. We are just not live flower kinda girls I guess. 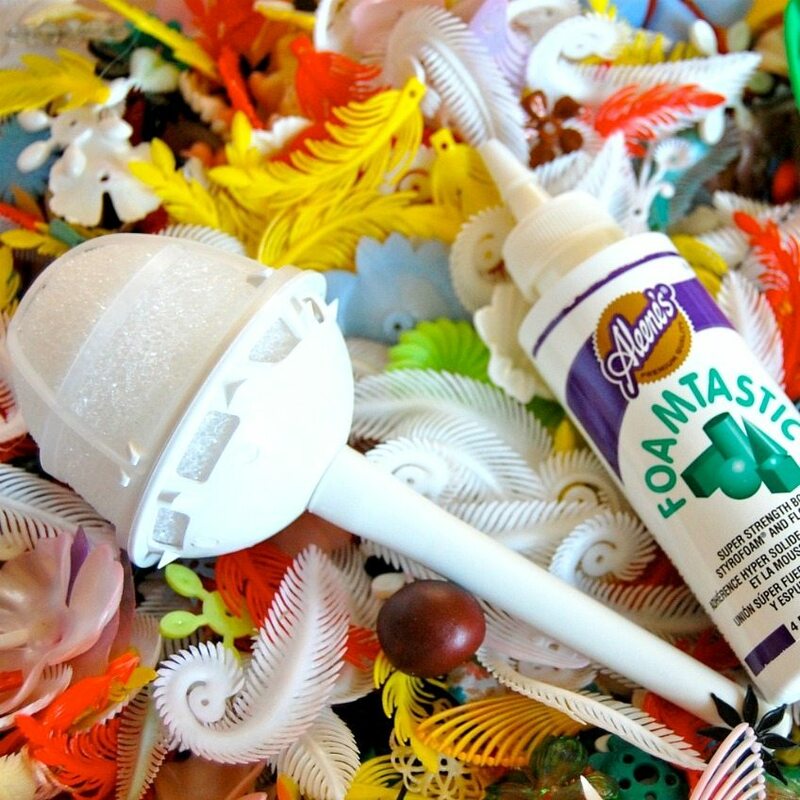 You can find foam bouquet forms online or in the wedding section of many craft stores. They come in all shapes and sizes. It takes a lot of flowers to fill a bouquet form. My petals are vintage from my jewelry making days, but you can find new versions online. Also, check the paper craft department for fun and funky floral options. Each of my flowers are 2-3 stacked petals with a small bead in the center on a jewelry headpin. Make sure the bead hole is smaller than the headpin so it does not slide off. 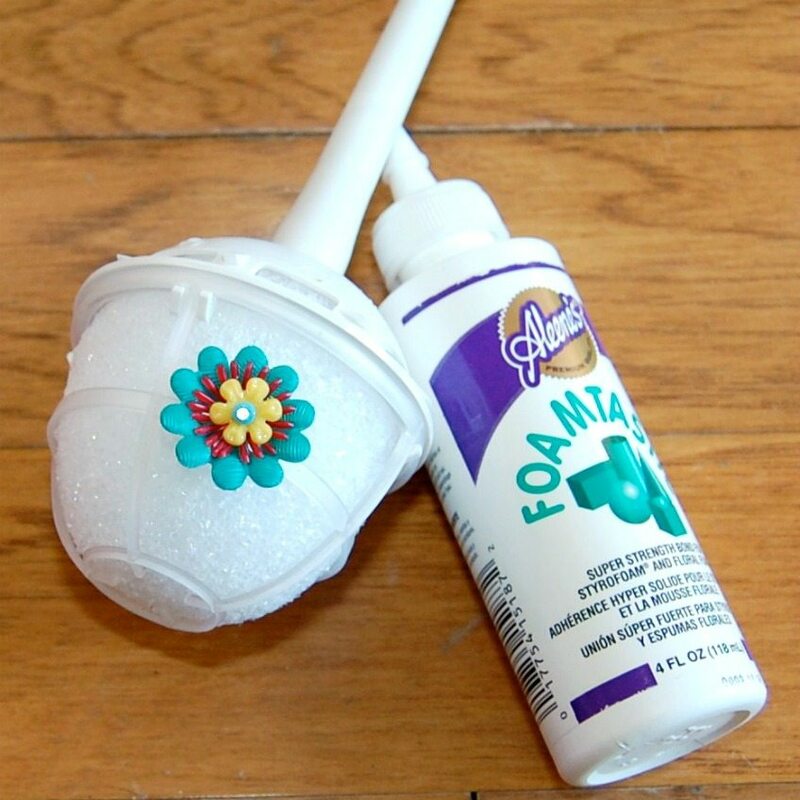 Insert the pins into the foam with a dab of foam glue. Hot glue will also work. 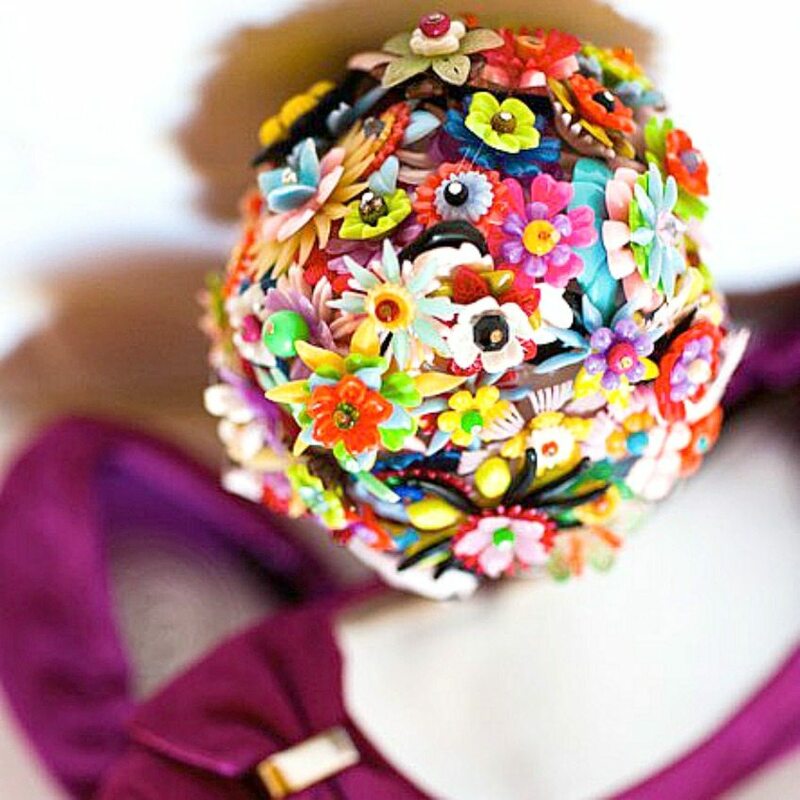 This just makes sure all the colorful flowers in the bouquet stay in place. You could also mix silk flower petals in with the plastic flowers for a more textured bouquet. You could even add in real flowers. If you like the plain handle that comes with a craft store bouquet form, more power to you. I however opted to wrap mine in fabric to match said hot pink bridesmaid dress. The best part about this crafty and colorful bridesmaid bouquet is that my sister years later still has it displayed in her house in a vase. It is too kitschy and fun to hide away in a box somewhere. That reminds me, I kinda want to make my own for a vase. 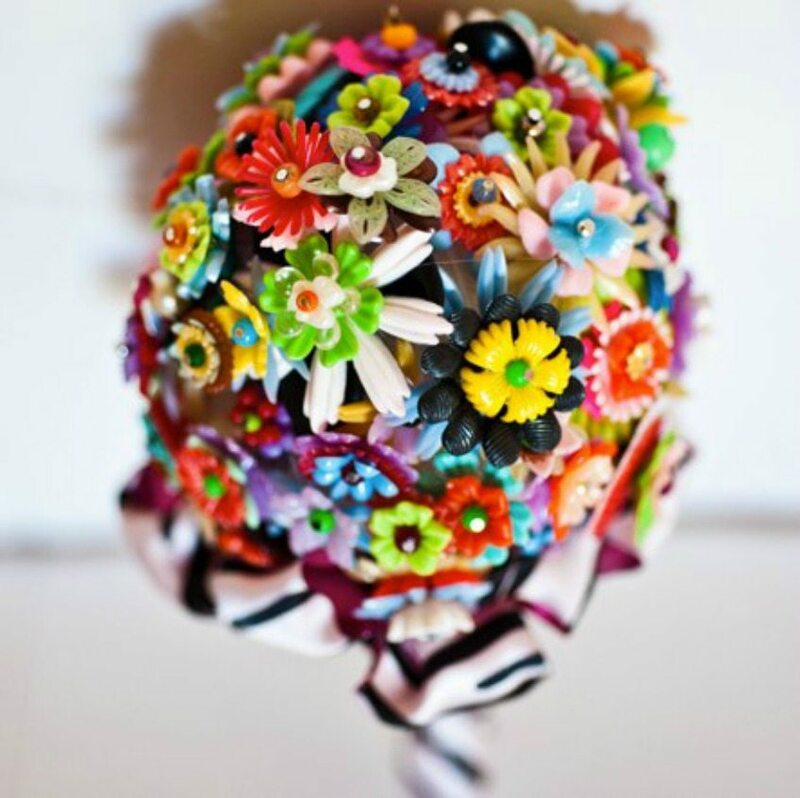 Would you carry a bouquet like this to your wedding? Want more funky flower inspiration? Keep reading! How to Display You Enamel Flower Pin Collection as a Topiary – I love all my groovy 60’s metal flower pins. Way to much to keep them in a jewelry box (even if it is a cute revamped jewelry box). 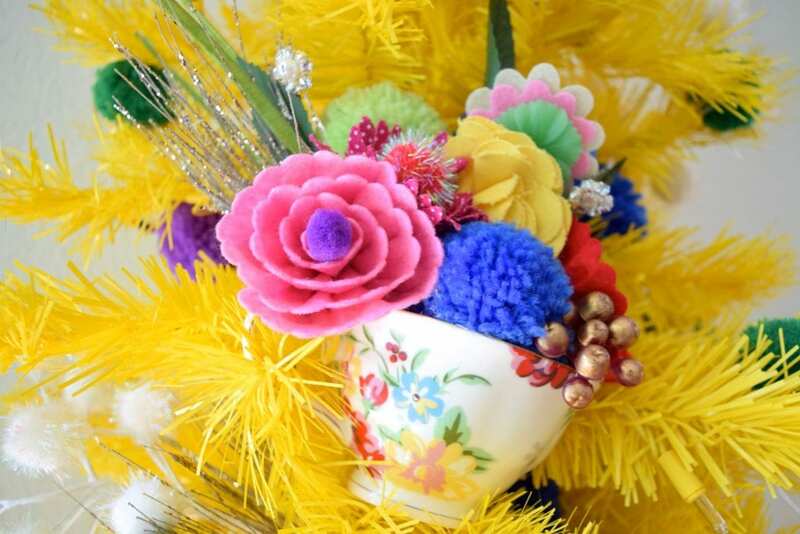 Mother’s Day Christmas Tree with Adorable DIY Teacup Bouquets – Ever been to a mommy and me tea party? No, me neither. 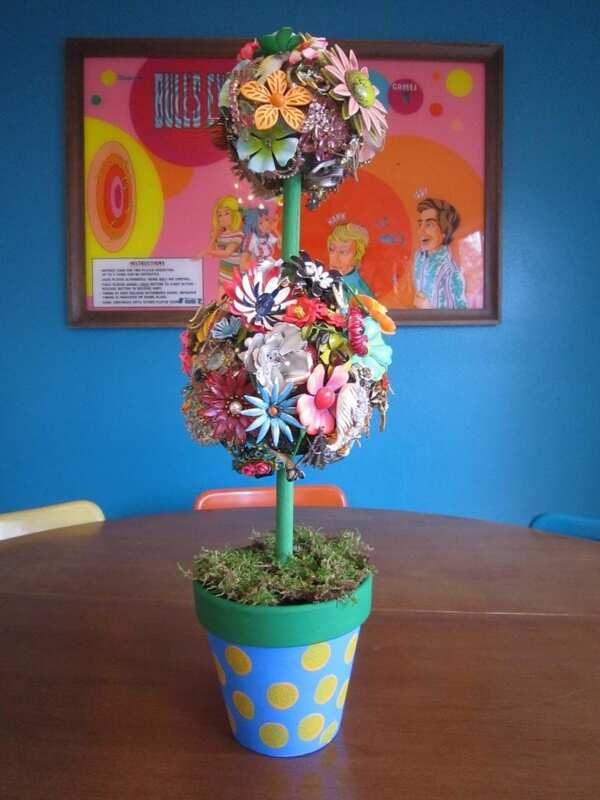 I have however decorated a tree for Mother’s Day full of colorful bouquets inside of tea cups. 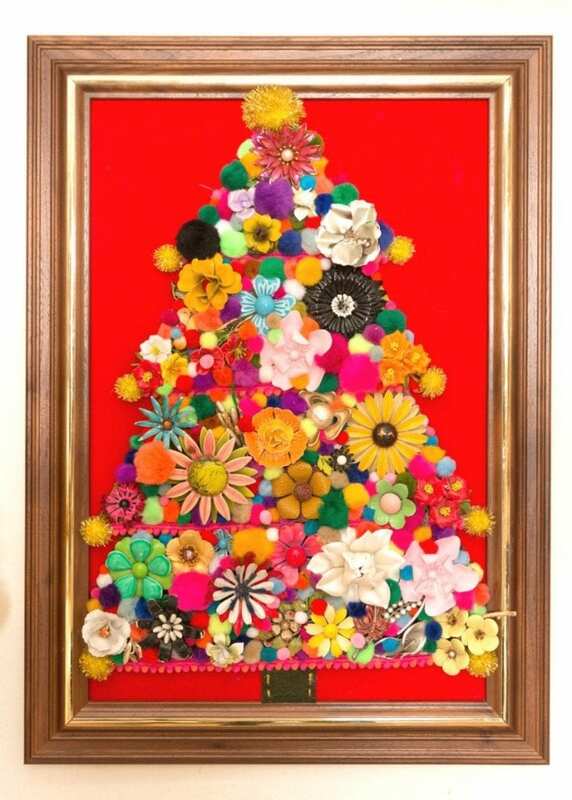 Colorful Jewelry Christmas Tree – Celebrate Kitschmas with this amazing spin on the classic retro craft of jewel trees using vintage Mod flower pins. Posted November 10, 2011 & filed under Crafts, Holidays, Parties, Wearable Crafts. Holy crap that's cool! Need to get me some bridesmaids…. 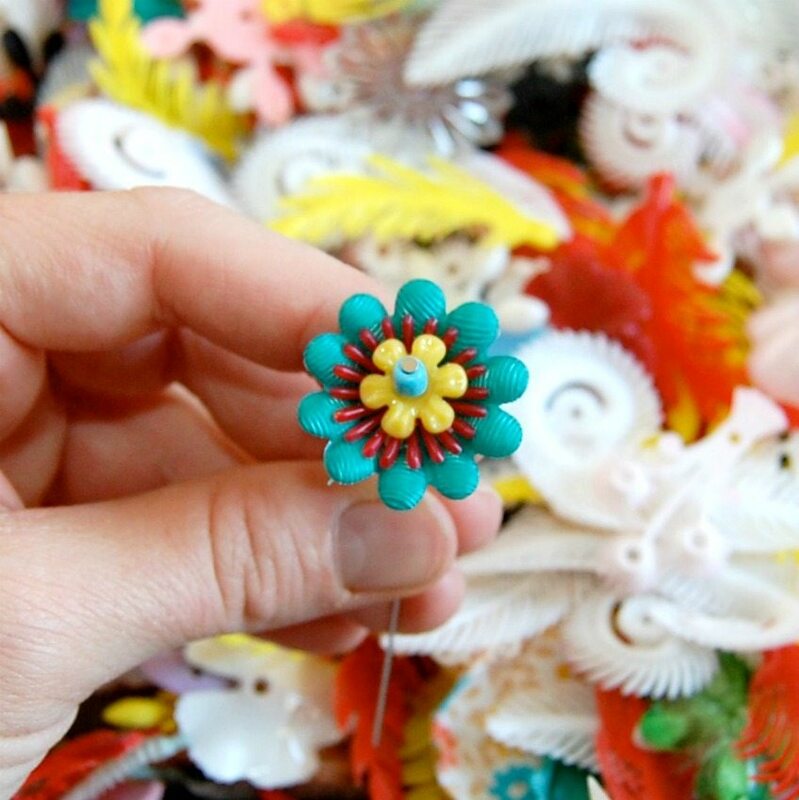 Where can you buy plastic leaves and flower beads like those? Hey guys I have collected them through the years. Etsy and eBay is your best bet. I got a lot from an old jewelry factory in Rhode Island. Amazing! I'll bet it was loads of fun to make too!!! Aviva if you click on the link at the bottom that says Cory Ryan it will take you to more pictures including the one my mom made for her out of rhinestone brooches. It's not a secret anymore. You introduced a different kind of approach. I love the bouquet. For a very large selection of acrylic/lucite flowers, you can check out http://www.thebeadingplace.com. We have a huge selection that would make an really gorgeous bouquet. I have been looking for something like this for my own wedding. This is the first one that matched my brightly-colored personalty 🙂 thanks! !